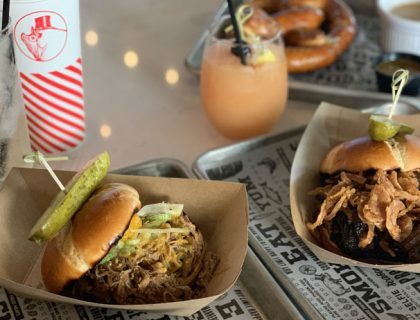 January is coming to a close, and we’ve gotta say that this month has felt more like Snackuary at Walt Disney World Resort. 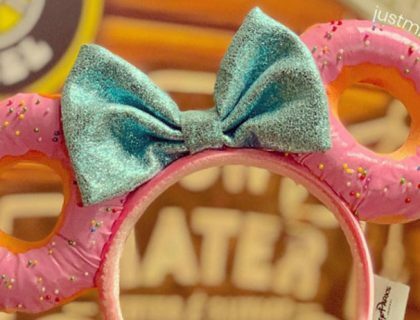 We saw new snack-inspired merch like the Alex and Ani D-Lish Snack Charms and the Disney Parks Snacks Housewares Collection, and that was just the start to all of the new snack stuff at Disney. 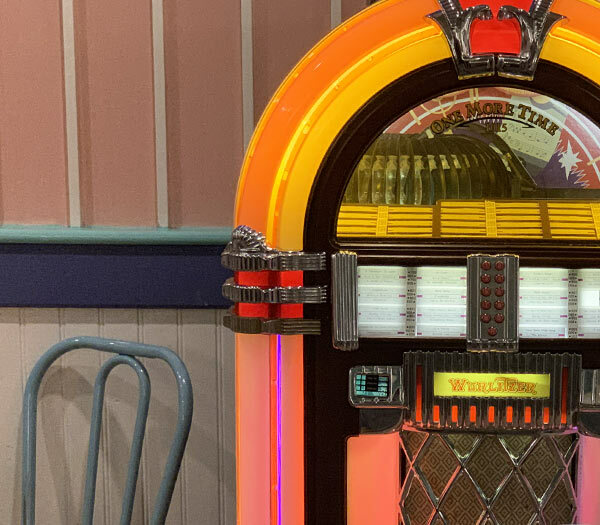 So let’s say goodbye to January with a look at one of our favorite snack spots – Beaches and Cream Soda Shop. When you’ve been watching some old-timey movies and thinking back on simpler times there’s only one thing you can do. 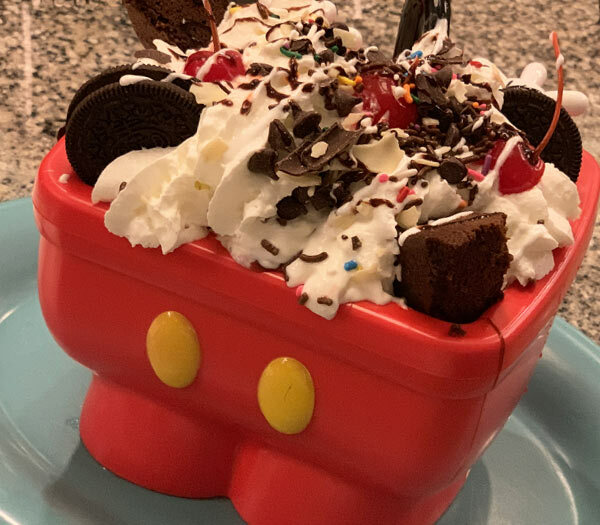 Grab your sweetheart and head over to Beaches and Cream Soda Shop where the Chili Cheese Fries are delicious and the Kitchen Sinks are served in a mouse pants and there’s plenty to share. Beaches and Cream is located between Disney’s Yacht and Beach Club Resorts. If you are visiting Epcot during your trip to Walt Disney World you can exit through the International Gateway and walk to this bopping spot. A 50’s tableau invites you to chow down on delectable diner foods and sweet treats. Diner food and favorites, burgers, patty melt, and fries. 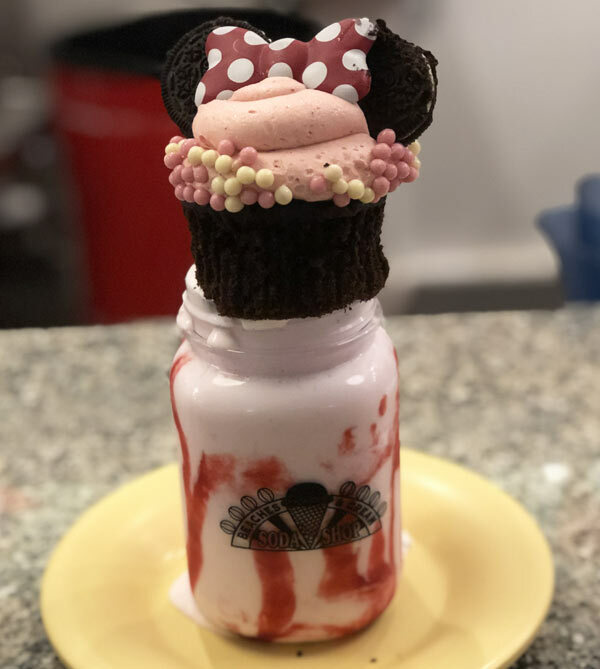 Burgers are great and all, but we’re here for the desserts, and Beaches and Cream delivers with a diner style distinctly Disney. 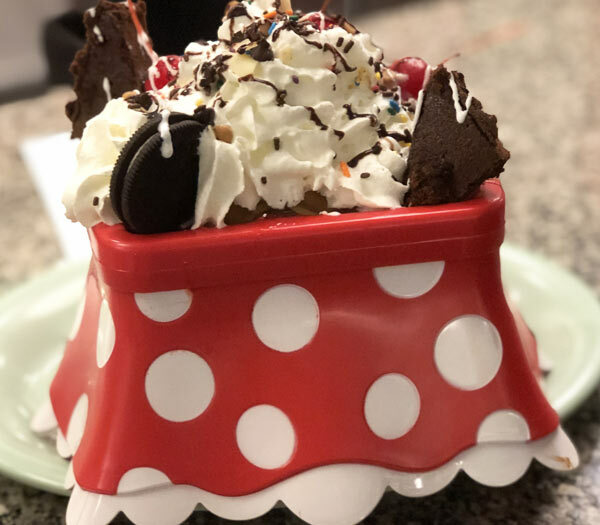 The biggest draw at Beaches and Cream is the Kitchen Sink. It’s an ice cream sundae big enough to serve four (and possibly more). You can even get it in a souvenir bowl that is part Mickey Mouse pants and part, well, sink. There’s also a Minnie version, that pops up occasionally. This is a popular spot, so reservations are highly recommended. If you aren’t feeling adventurous enough to take on the Kitchen Sink there are plenty of other delicious dessert options to take advantage of. There’s ice cream sodas, root beer floats, banana splits, sundaes, and milkshakes topped with cupcakes. Yep, you read that right, milkshakes with cupcakes on top. Choose from vanilla, chocolate, strawberry, cherry, or pineapple. Made with Coca-Cola or Barq’s Root Beer. 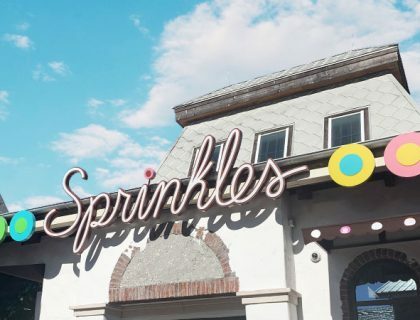 Choose from vanilla, rainbow sherbert, strawberry, chocolate, butter pecan, cookies and cream, mint chocolate chip, or fat-free chocolate-vanilla swirl. Rainbow sherbet, vanilla ice cream, and seltzer. Blended and topped with whipped cream and candied orange slice. Ice Cream topped with whipped cream, sprinkles, and a cherry. Banana, three-scoops of ice cream (vanilla, chocolate, and strawberry). Topped with pineapple, strawberry, marshmallow, hot fudge, caramel, toasted almonds, whipped cream, and a cherry. Brownie covered with hot fudge, three-scoops of vanilla ice cream, Oreo cookies, and whipped cream. Topped with chocolate syrup and a cherry. Scoops of vanilla, chocolate, strawberry, cookies and cream, and mint chocolate chips. Topped with all the toppings available. There are also Chocolate Lovers or Neapolitan options. Three-scoops of vanilla ice cream with hot fudge, marshmallow topping, and Snickers pieces. Topped with whipped cream, chopped peanuts, and a cherry. Two-scoops of ice cream with your choice of one of the following toppings: marshmallow, strawberry, pineapple, peanut butter, hot fudge, caramel, or chocolate syrup. Topped with whipped cream, toasted almonds, and a cherry. You can get extra toppings for $1 each. Three-scoops of ice cream with your choice of one of the following toppings: marshmallow, strawberry, pineapple, peanut butter, hot fudge, caramel, or chocolate syrup. Topped with whipped cream, toasted almonds, and a cherry. You can get extra toppings for $1 each. Peanut butter and hot fudge with chocolate and vanilla ice cream, peanut butter and chocolate morsels, whipped cream, and a cherry. You can see the entire Beaches and Cream menu and reserve a table at Disney’s Website. Have you been to Beaches and Cream? 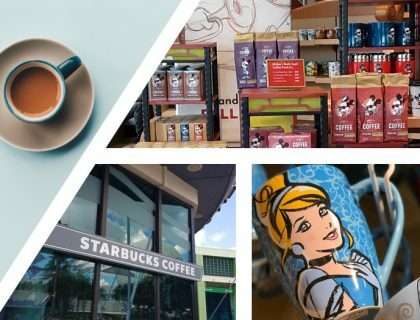 We’ve love to hear your thoughts on this popular Walt Disney World Resort. 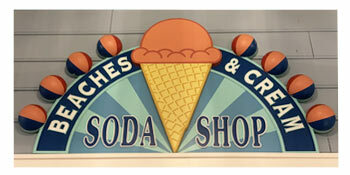 The Beaches & Cream Soda Shop will be temporarily closing in early August for a refurbishment. The update is expected to last 3 months, so reserve a table now and fill up on ice cream like a bear about to go into a 3 month hibernation.